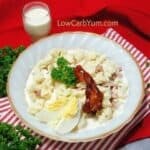 A mock low carb potato salad made with cauliflower. It’s the perfect dish to bring to a summer potluck picnic for those watching their carbs. 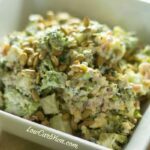 Are you looking for a tasty salad to take along to a summer potluck party? Why not make a mock potato salad out of fresh cauliflower. 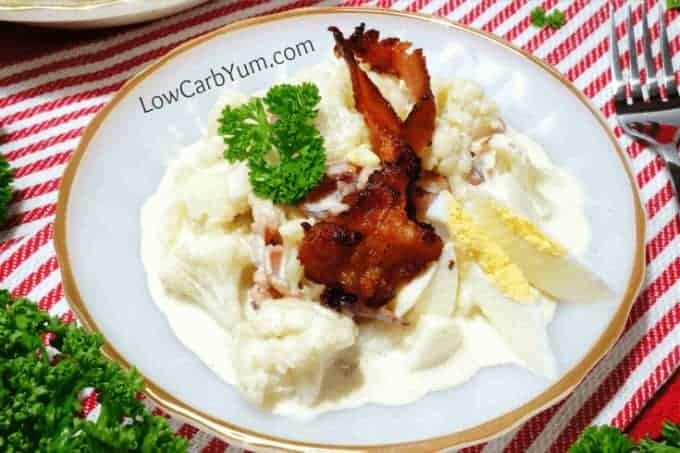 When making this mock potato salad with bacon, you don’t want the vegetable to be too soft. To keep it firm, it’s only steamed for a minute then quickly cooled. To make this low carb potato salad, you’ll need a whole medium head of cauliflower. It’s best to cut up the vegetable into bite sized pieces so it will be easy to eat. Although it’s tough to disguise, the bland flavor of cauliflower makes it a great substitute for potato. I suppose a daikon radish would look more like a potato when chopped. Cauliflower is much easier to find than daikon. 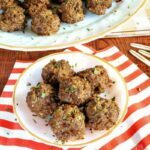 And, it’s the most popular low carb vegetable to replace a potato. Our traditional potato salad recipe mixes hard boiled eggs in. We love the flavor of the eggs and they add some protein. 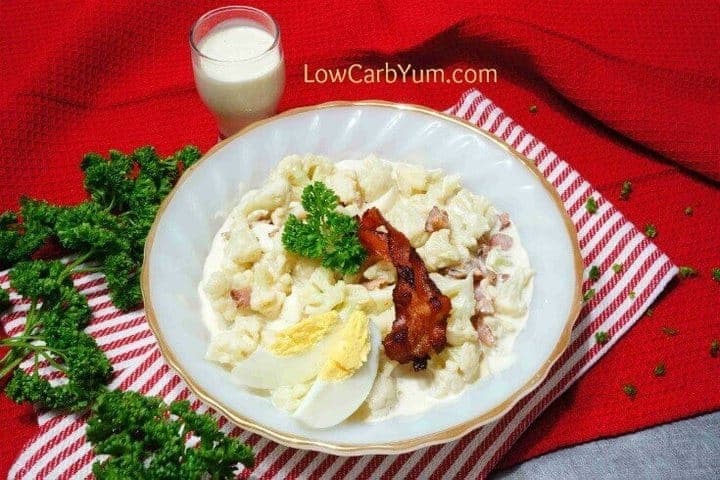 If you don’t like eggs, you could leave them out of this mock low carb potato salad. But, you’ll need another filler to thicken the dressing. Bacon is also added to enhance the flavor. Although some like to add onions or chopped pickles, I left those out of this salad. However, I did sprinkle in some onion powder. Once you have all the ingredient cooked, the salad comes together quickly. You do need to quick steam the cauliflower, fry up some bacon and hard boil the eggs. It doesn’t take much time do. I usually cook extra bacon and eggs to serve on the side. 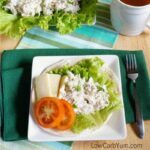 Can you ever get enough of those on a low carb high fat diet? 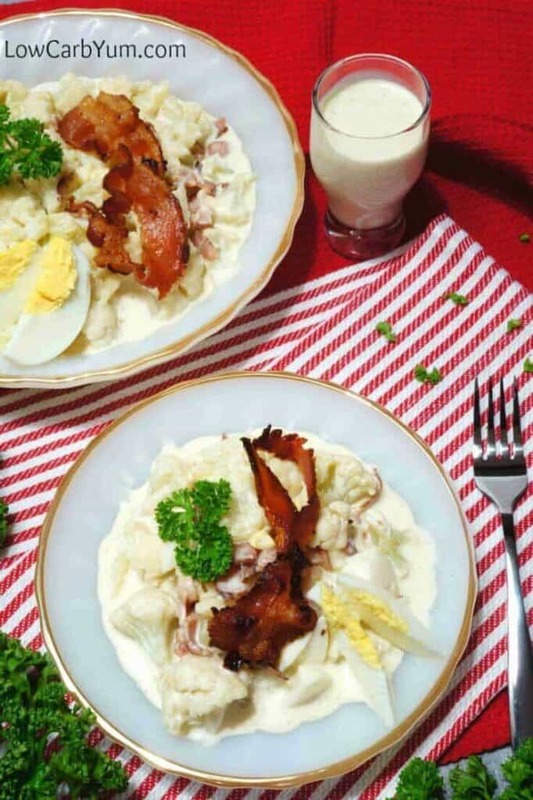 If bringing to a party, you may want to decorate the top of the mock potato salad with extra bacon and sliced eggs. 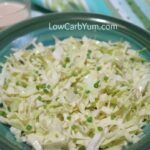 Who needs potato salad when you can make a healthier low carb cauliflower salad instead? 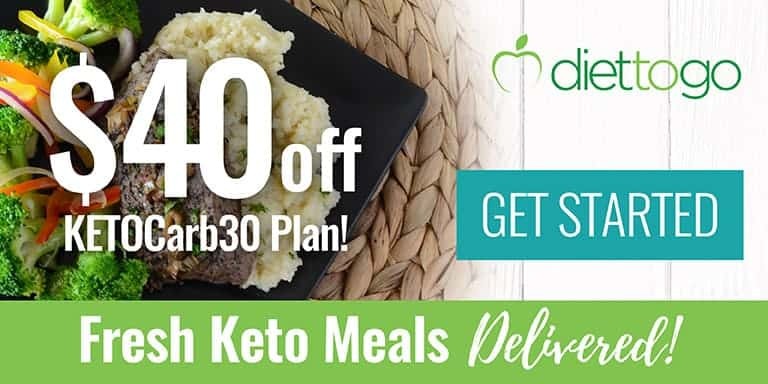 Once you’ve moved away from high starch foods, you’ll never miss them. There are so many better choices to take their place. 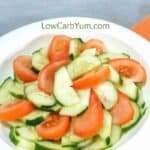 If you need some other ideas for low carb summer salads, you’ll want to check out the recipe round-up here. There’s a lot of other easy summer salads in that collection. 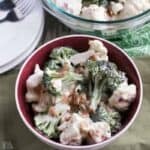 Another favorite summer salad of ours is made with broccoli. You can find that recipe in this post. 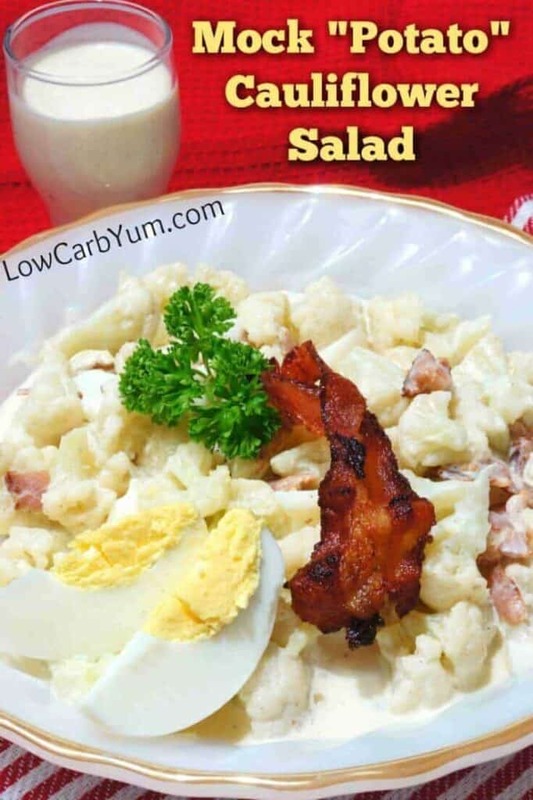 It’s a yummy salad that adds bacon and cheese. 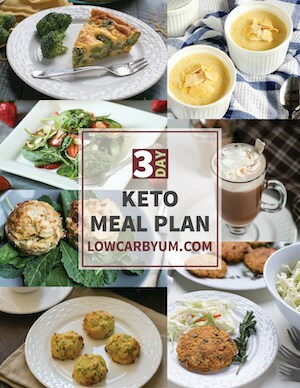 There’s also a nice collection of low carb cauliflower recipes over at All Natural Ideas. It’s really amazing what you can do with this versatile vegetable. 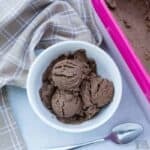 It’s even hidden in some dessert recipes! 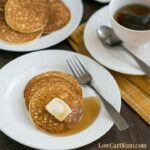 Lisa over at Drop The Sugar found a way to hide cauliflower in a low carb pumpkin pie in this recipe! 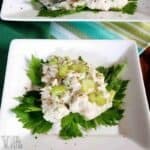 This low carb cauliflower salad is made to taste like potato salad. It's the perfect mock potato salad to bring to a potluck for those watching their carbs. Bring water to boil in large saucepan. Add cauliflower, then sprinkle with salt. Cover and bring to full boil again. Boil 1 minute, drain in colander, then rinse in water until cool. Set aside. Whisk mayonnaise, sour cream, and vinegar in large bowl until smooth. Add seasonings and mix in. 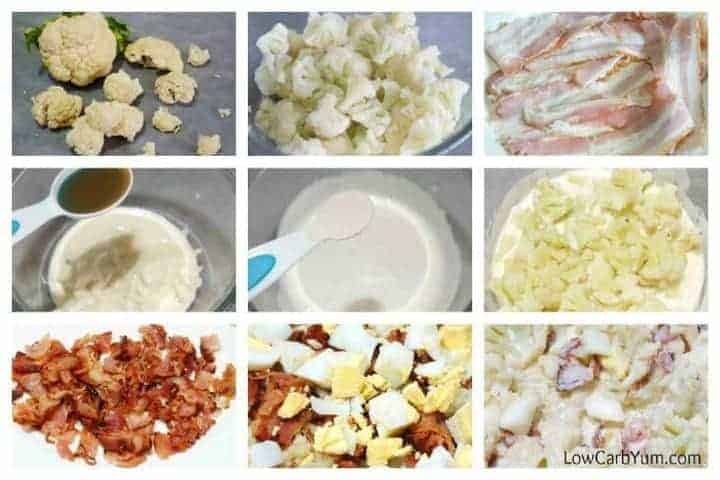 Add cauliflower, bacon, and egg. Toss to evenly distribute dressing into cauliflower.